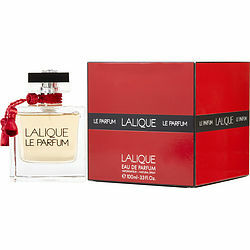 Lalique le Parfum by Lalique is a bold fragrance for women. It is ideal for evening use, so you can apply it before going out for a girls' night out or before leaving for a night of dancing. The pink peppercorn, bay leaf, heliotrope, jasmine, vanilla and patchouli combine to give the fragrance a woodsy, yet feminine scent. Introduced in 2005, women who want a fragrance that stands out from other scents are sure to appreciate it. Lalique le parfum. First time I have tried this. I was very pleasantly surprised. I like the mix. It was lite and fresh with a under tone of something else. The sent stays with you all day. This is my first bottle of LALIQUE LE PERFUM. I watched a youtube review & decided to try it. I would say that this is a unisex scent. I am a 69 year old male & I really like it. This is a fresh scent that is a little sweet with some vanilla plus some other scents that cut thru the sweetness. This is a pleasant smelling fragrance that could be warn any season, but probably not on a hot summer day. For the price it's worth a try. Lalique 'Le Parfum' has overtaken Miss Dior and Chanel Coco as my favourite perfume. It's a beautiful, unique fragrance that makes me feel special when wearing it. Bottle is quite lovely too with a pretty red tassel around the stopper, making it a perfect gift.